I’ve talked before about how I have specific uses for both soft and hard colored pencils (just as it’s useful and often necessary to have several grades of graphite pencils). 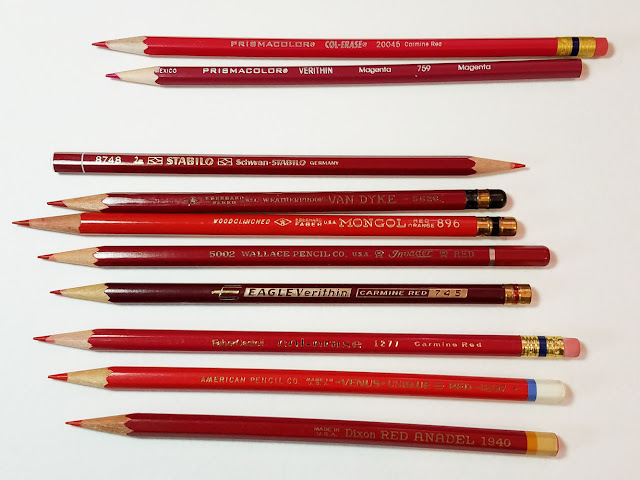 But as I’ve reviewed various vintage colored pencils that turned out to be harder than any contemporary colored pencils I’ve used, I started thinking about how some of them are so hard that they could be used for writing as well as drawing. When I want to write with color, I tend to choose fountain pen inks or gel pens, but every now and then a colored pencil is just right. I know, too, that many editors and teachers use colored pencils to correct or mark up copy. Colored pencils hard enough to write with have their place. 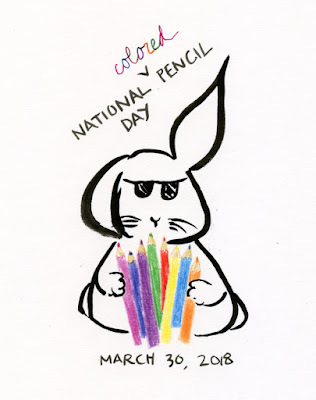 Since today is National Pencil Day, I decided to write this crossover review: I compared some of my hardest colored pencils and selected the ones I could see myself writing with for whatever reason. Some contain enough pigment that they are also excellent for detail work in drawing. Shown below are scribble tests I made on a sheet of ordinary copier/printer paper, which is often what editors and teachers need to write on. While the hardest cores are the vintage Eberhard Faber Mongol, Wallace Invader, Eagle Verithin and Dixon Anadel, they also contain the least amount of pigment, making them harder to see. 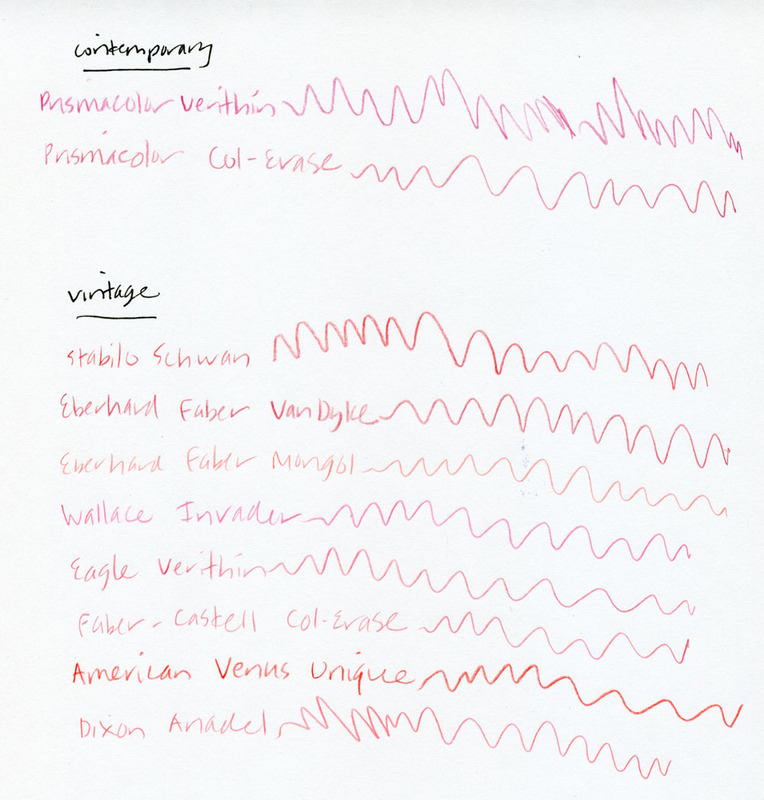 My favorites are very slightly softer but also contain enough pigment that they are practical for writing: vintage American Venus Unique and vintage Stabilo Schwan. The Stabilo is a good balance between hardness and color intensity, but it’s also scratchy compared to the Venus Unique. A third contemporary pencil that I couldn’t include in this comparison is the Staedtler Noris. Very hard, possibly harder than either Prismacolor mentioned above, Staedtler Noris colored pencils are available in a wide range of colors. Instead of wood, the cores are covered in Wopex, which is some kind of recycled product that makes me think of plywood. The reason that I couldn’t include them in my comparison is that the first time I sharpened one, I broke my electric sharpener on it! (Note to self: Plywood can’t be sharpened.) I immediately got rid of the (admittedly inexpensive) set. However, if you use a knife to sharpen them, I think they might qualify as a good colored pencil for writing. 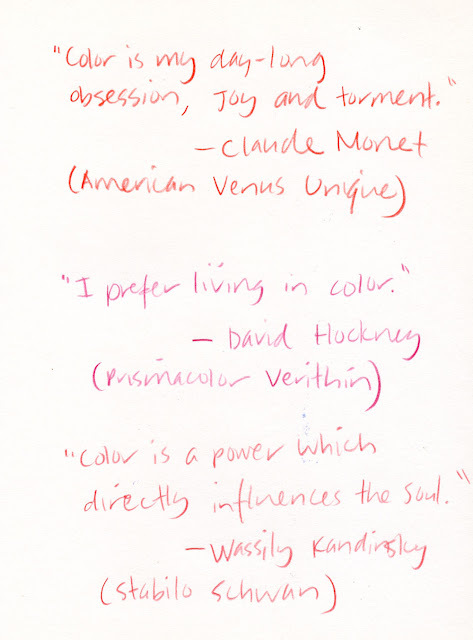 As a final test, I used my top three – vintage American Venus Unique, contemporary Prismacolor Verithin and vintage Stabilo Schwan – to write in a Baron Fig journal, which is a bit toothier than copier/printer paper. All three were fine, though the Venus was my favorite for being the smoothest. When I say these are hard enough to write with, I’m not talking about H or HB hard; I’d say they are more like 2B or Blackwing Pearl hard. Some writers would find that too soft, but I prefer writing with softer pencils, so they are good enough for me. Some of those vintage pencils that are too light in pigment are probably closer to an HB. 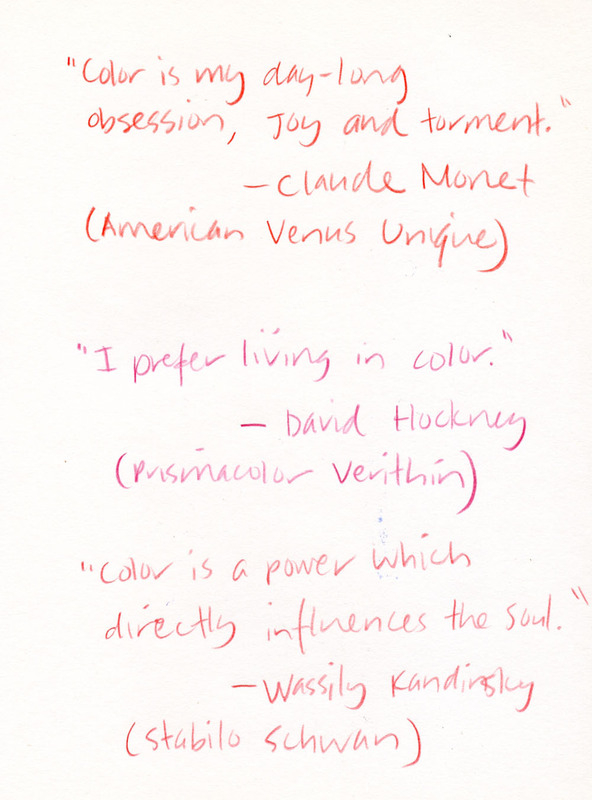 If you are not a writer, editor or teacher and have no use otherwise for writing with colored pencils, let me just say this: We can all use more color in our lives. Why not write today’s shopping list with a colored pencil? 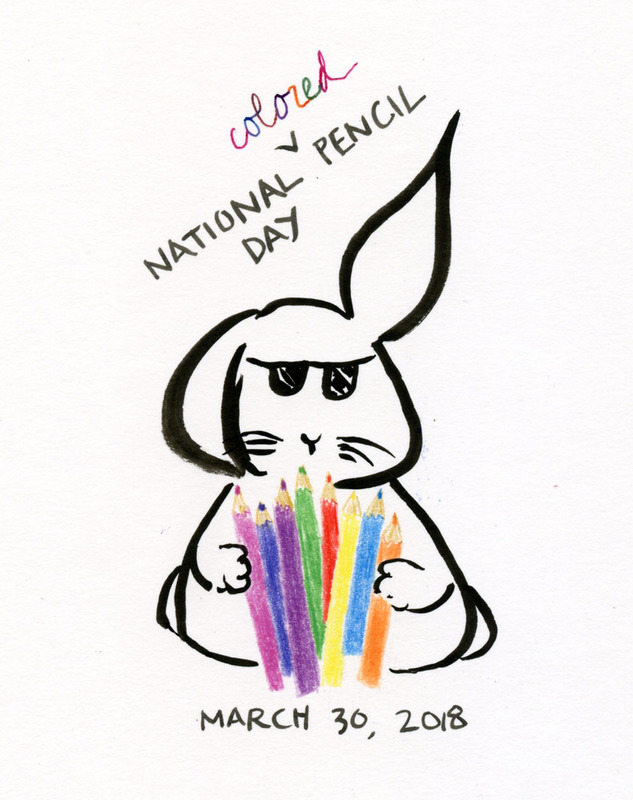 Happy National (Colored) Pencil Day! Great review of colored pencils, Tina. I especially liked your use of famous quotes to test your pencils. Thanks for all the research, links and pertinent information.